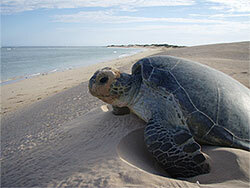 Implement effective protection of important nesting beaches in cooperation with the management agency. 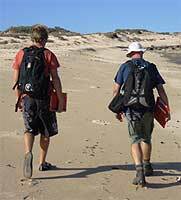 Research conducted by the NTP assists management, planning and development agencies along the Ningaloo coast in making conservation based decisions by identifying. 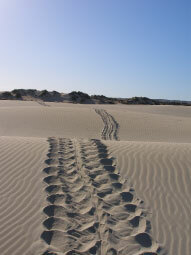 The NTP requires volunteer “Turtle Trackers” to record turtle nesting data along the beaches of the North West Cape (nearest township is Exmouth ) in Western Australia. For specific information please see Dates & Costs. 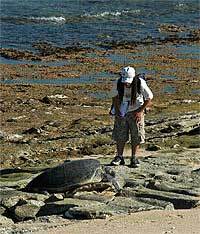 Starting at 5.30am you will spend 4-5 hours collecting data on turtle nesting beaches. 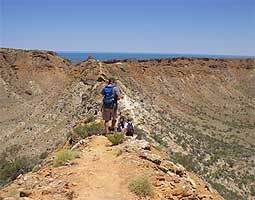 Once completed you will have the rest of the day to explore the Ningaloo Coast, join in the laid back lifestyle at Exmouth township, travel inland to some of the spectacular gorges in Cape Range National Park, partake in regular volunteer social activities or catch up on sleep! 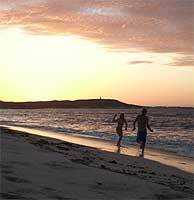 Remote camping on the Ningaloo Reef and monitoring isolated beaches.